Now that you have verified your minimum requirements, and configured your hardware and software, you are ready to install Toon Boom Harmony. If you are not upgrading from a previous installation of Toon Boom Harmony, go directly to Installing Toon Boom Harmony. If you are performing an upgrade, you should pick a time when Toon Boom Harmony production is slow or stopped. During the upgrade, no users can run any of the Toon Boom Harmony modules and all rendering jobs must be stopped and complete. 1. Make sure that no one is running Toon Boom Harmony. All Toon Boom Harmony modules must be closed on the server and on all of the clients. 2. Make sure that all batch rendering or vectorizing is complete or that the queues are empty. You can check the status of the Vectorize and Render queues from the Control Center module. 3. In the Control Center module, use the Queue menu to open the Vectorize and Render Queue for all environments. The queues should either be empty or the status of all jobs should be "Completed". ‣ Click the Start menu, select All Programs > Toon Boom Harmony (or Opus) > Configuration Tools > usa_cfg. The USAnimation Properties window opens. ‣ Click the Start menu, select All Programs > Toon Boom Animation > Toon Boom Harmony > Tools > Harmony Control Panel. The HarmonyProperties window opens. ‣ Click the Start menu, select All Programs > Toon Boom Harmony > Tools > Control Panel. The Harmony Control Panel window opens. 4. Select a process from the Process Starter drop-list and click Stop. Do this for every Toon Boom Harmony related process running on the machine. During this process, you will be able to stop the tbdbserver on the server and tbprocess on workstations that are set as a batch render. 5. Turn off all of the client machines and the render farm. ‣ First, click the Start menu, and select All Programs > Harmony > Configuration Tools > FLEXlm - lmtools. • If you are upgrading from version 7.3 click the Start menu, and select All Programs > Toon Boom Animation > Harmony > Tools > Flexlm Tools. • If you are upgrading from version 7.8 click the Start menu, and select All Programs > Toon Boom Harmony 7.8 > License Tools > Flexlm Tools. ‣ Next, in the Start/Stop/Reread tab, select the license server in the Remote Server List. ‣ Click the Stop Server button. 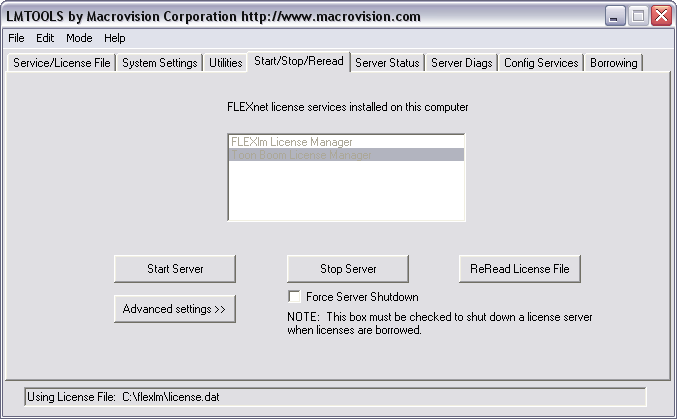 ‣ In the Config Services tab, click the Remove Service button to remove the license service. 7. Close FLEXlm " lmtools". To complete the installation, you need to remove some environment variables set by the previous installation. Please do this with caution. 1. Click the Start menu and select Control Panel. 2. Double-click on System and select the Advanced system settings link in the left panel. 3. In the Advanced tab, click on the Environment Variables button. 4. 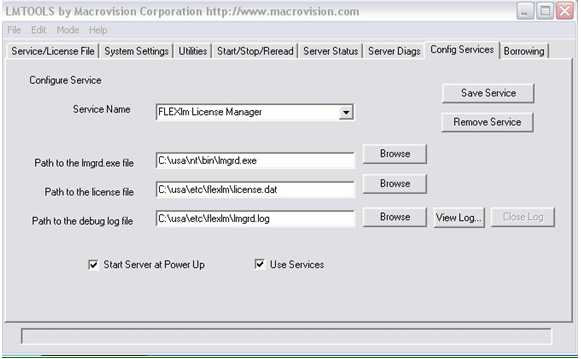 In the System Variables panel, select LM_LICENSE_FILE if it is listed, and then click Delete button to delete LM_LICENSE_FILE. 5. Delete any of the following variables if they appear in the System or User variables lists: TOONBOOM_LICENSE_FILE, USADB, USADIR or USAROOT. You also need to back up any necessary configuration files from the machine in case you want to reuse them. You can also back up the license.dat during this procedure. ‣ For V7.8, go to \Program Files (x86)\Toon Boom Animation\Harmony 7.8\etc. 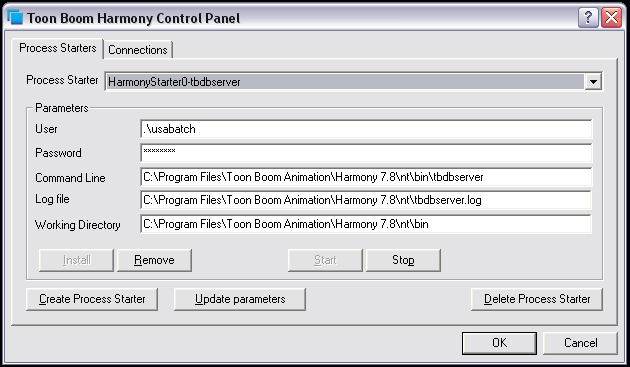 ‣ For V7.3, go to \Program Files (x86)\Toon Boom Animation\Harmony\etc. ‣ For V7.2 and earlier, go to the \usa\etc folder. ‣ Scan.conf if this workstation is to be configured as a scanning station. ‣ VectOptions.conf from any machine (including the server) that is doing a batch vectorization. ‣ Any other.conf file that is required to be used later. You can back up the whole /usa or harmony folder to ensure all configuration file are backed up. Once you finish all the steps above, you should uninstall the previous version of Harmony or Opus. 1. Click the Start menu and select Control Panel. The Control Panel opens. 2. Double-click Program and Features and choose Harmony or Opus from the program list. And then, click Uninstall from the top menu. For the server upgrading process, please backup the database by exporting the whole database. This will prevent you from losing any data during the upgrading process. You can, however, back up current /usa_db and /usadata by renaming them (this procedure can only be used when installing on the same server). But this will require extra caution, if you are at all unsure contact your system administrator or Toon Boom Animation Support. 1. Download the build of Harmony that you are going to install. 2. Double-click on the Harmony InstallShield executable. 3. Select the language in which you want the installer to execute and click OK. This will only affect the installer and will not change the language of the actual software. 4. In the InstallShield Welcome window, click Next to continue with the installation. The License Agreement dialog box appears. 5. Read the license agreement and decide if you accept its terms. ‣ If you accept the terms in the license agreement, select I accept the terms in the license agreement then click the Next button. ‣ If you do not accept the terms in the license agreement, click I do not accept the terms in the license agreement then click the Next button. The installation will stop immediately and Toon Boom Harmony will not be installed on your computer. The Destination Folder dialog box appears. You can click Cancel to interrupt the installation and then click Yes to stop the installation completely. You can install Toon Boom Harmony to any location. In this installation guide, it assumes that the installation process is done to the default location. 6. Select the drive on which you want to install Toon Boom Harmony and click Next. The Setup Type dialog box appears. 7. Select the type of installation you want to do. Click on the Complete radio button to install all of the Harmony components. When installing a server, it is possible to do a custom install and install only the server component. However, it is recommended to always do a full install, this will give access to all the applications from the server if need be. 8. Click the Next button. The Ready to Install the Program dialog appears. 9. Click Install again to begin the installation. When this process is complete, click Finish.